The winds were howling. From the shore, it was clear that this storm was a brutal one – the kind that made November waters treacherous in the Great Lakes. On November 10th at 7:10pm, the SS Edmund Fitzgerald’s captain’s voice crackled over the radio. “We’re holding our own,” he called out. A short distance away, the Fitzgerald’s companion ship, the SS Arthur M. Anderson, battled brutal waves. At 6:30pm, a massive wave, measuring 35 feet, struck the Anderson, but she stayed afloat. 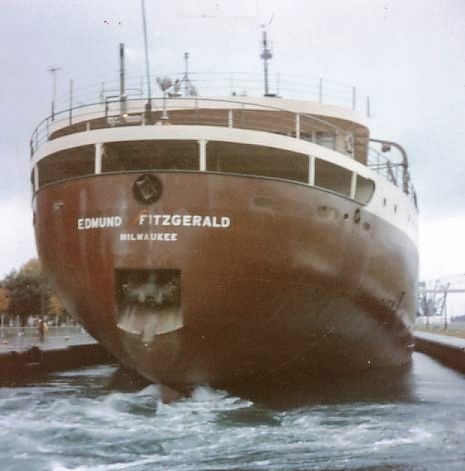 When she launched, the Edmund Fitzgerald was the largest on the Great Lakes. As she fought to stay on course, it may have factored into her demise. She fell prey to what some locals refer to as the “witch of November”. Late fall storms on the Great Lakes bring cold Arctic air down to the lakes as the last warm fronts of the year dissipate. The resulting storms are merciless, and largely responsible for the estimated loss of more than 30,000 people in over 10,000 shipwrecks over the past 300 years on the Great Lakes. Rumors and speculation blamed crew members, the weather, the heavy load the ship was carrying, and a number of other factors for the wreck. 29 sailors, 26,000 tons of taconite pellets for iron making, and the actual answer as to why the Edmund Fitzgerald sank went down shortly after the captain’s last words. 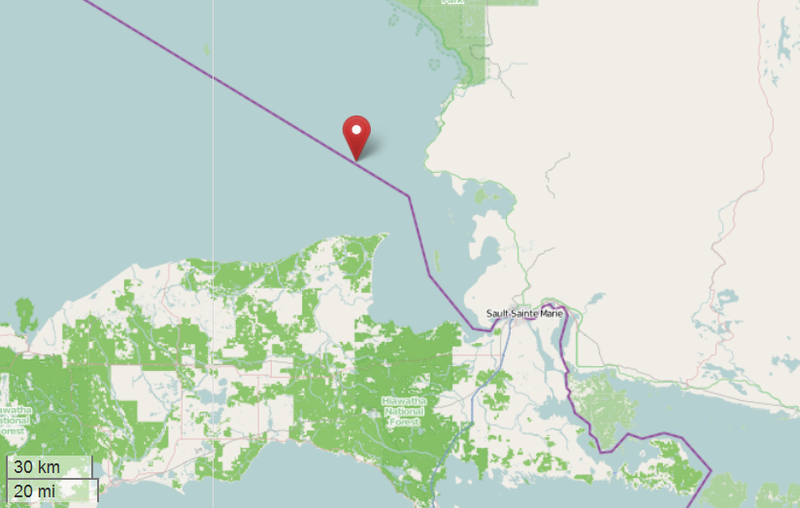 Site of the SS Edmund Fitzgerald’s shipwreck is marked with the red pointer. Today, the Edmund Fitzgerald is a memory; one that won’t likely be forgotten in the near future. Canadian soft rock singer Gordon Lightfoot memorialized the shipwreck in his song “The Wreck of the Edmund Fitzgerald.” Canada released a coin with the shipwreck painted on it this year as the third and final installment in a commemorative shipwreck series, and this year – the 40th anniversary of the wreck – the ship’s loss is still felt on the Great Lakes, where she was based. Take a moment to think about the crew onboard, their families, and their lives. And if you ever go boating on the Great Lakes, look out for the witch of November.